On October 4, 1957 the space age began. The Soviet Union launched "Sputnik", the very first man-made satellite, into earth's orbit. Sputnik, only about 23 inches wide, weighed some 184 pounds. It was designed to orbit the Earth at about 18 thousand miles per hour at an altitude of 560 miles. Scientists around the world could hear Sputnik transmitting electronic signaling back to earth and speculated on the information contained in those beeps. Years later, the people who launched Sputnik confessed the beeps were used simply to help track the satellite. Sputnik's launch triggered the so-called "space race" between the United States and the Soviet Union. That race didn't let up until twelve years later, when the U.S. successfully sent astronauts to the moon in 1969. 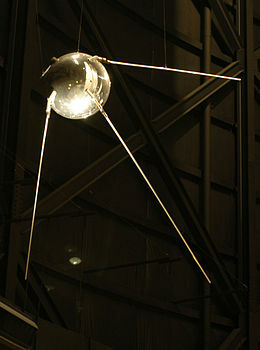 Sputnik itself provided scientists with valuable information, even though it was not equipped with sensors, by tracking and studying the satellite from Earth. The density of the upper atmosphere could be deduced from its drag on the orbit, and the propagation of its radio signals gave information about the ionosphere. Sputnik 1 was launched during the International Geophysical Year from Site No.1/5, at the 5th Tyuratam range, in Kazakh SSR (now known as the Baikonur Cosmodrome). The satellite travelled at about 29,000 kilometres per hour (18,000 mph; 8,100 m/s), taking 96.2 minutes to complete each orbit. It transmitted on 20.005 and 40.002 MHz, which were monitored by amateur radio operators throughout the world. The signals continued for 21 days until the transmitter batteries ran out on 26 October 1957. Sputnik 1 burned up on 4 January 1958, as it fell from orbit upon reentering Earth's atmosphere, after travelling about 70 million km (43.5 million miles) and spending three months in orbit.